Slack's Edgewater Beach Resort is located 6 miles east of Hayward, Wisconsin, one of the busiest and best shopping centers in Northern Wisconsin. We are one mile from the LCO Casino and convenience store. Located in Edgewater Bay on one of the cleanest lakes in the Hayward area, Round Lake, this family-owned resort consists of two, two-bedroom cabins (plus sofa sleeper), and has much to offer vacationers. You will find Round Lake to be a majestic body of clear blue water. Its many bays offer fishermen safe fishing, even on the windiest days. About every species of fresh water fish are found in Round Lake, from the fighting Musky to the beautiful Blue Gill. For fishing, swimming, boating, and water skiing, Round Lake is an ideal lake. Boats & Motors: A fishing boat comes with your cottage, with a local marina within a couple miles for the convenience of motor rentals. In the alternative, you may bring your own fishing boat, speed boat, or pontoon. Your whole family will enjoy our wonderful sand beach, diving float, paddle boat, and canoes. Our swimming area has no drop-offs and is completely free of weeds. Many rock beds are nearby, which makes for great fishing. We have even had guests catch a great panfish dinner straight off the docks. Weekly cookout hosted on Thursdays at 5:00 p.m. where a home cooked meal and camaraderie is to be had by all. Please note: Reservations for more than 4 people are subject to a $100 a week/per person charge to cover the additional laundry, cleaning, etc. fees. We are a family owned and operated business. We have been around since the 60s and treat our guests as family. You can't get closer to the lake! These cabins are grandfathered in and so close to the water! It's simply breathtaking! Great beach and swimming area with diving raft! We also offer a weekly BBQ (fully catered by us) to you so we can get to know you! Each cabin is equipped with a gas-insert fireplace. Each living room has a pull-out couch, recliner, end tables, and various other chairs for your comfort. Full kitchen, complete with stove, microwave, refrigerator, sink, dishes, pots and pans, utensils, etc. Kitchen table seats four comfortably. There is also a picnic table outside for your use. There are row boats, paddle boats, and canoes available for your use. The cabins are located mere feet from Round Lake and it's one of the cleanest lakes in the area for swimming! It's a great way to cool off on those hot summer days. Excellent on the lake property! Property owner very friendly. Cabin was clean and well equipped. Views of lake were exactly as described. Highly recommended. Thank you Marie for a wonderful vacation! It was wonderful! So close to the water and it was clean and beautiful. Rock free sandy beach and all along the dock. Great swimming, fishing and relaxing. The Cedar cottage was cute and quaint. Perfect size for our family. My 3 year old loved all of it! The beach and swimming were perfect for her and us also. Great time and will defiantly be coming back again. Thanks Marie for your hospitality! Thank you for staying with us. Please let us know where we failed to get five stars, as your review sounds positive and we want to insure satisfaction. The accommodations were above our expectations! It was clean, and had everything we needed. It was peaceful, relaxing, and very happy with our stay. We would highly recommend it to everyone looking for a great place to stay and enjoy beautiful Round Lake! Best N. WI Rental experience, hand's down! 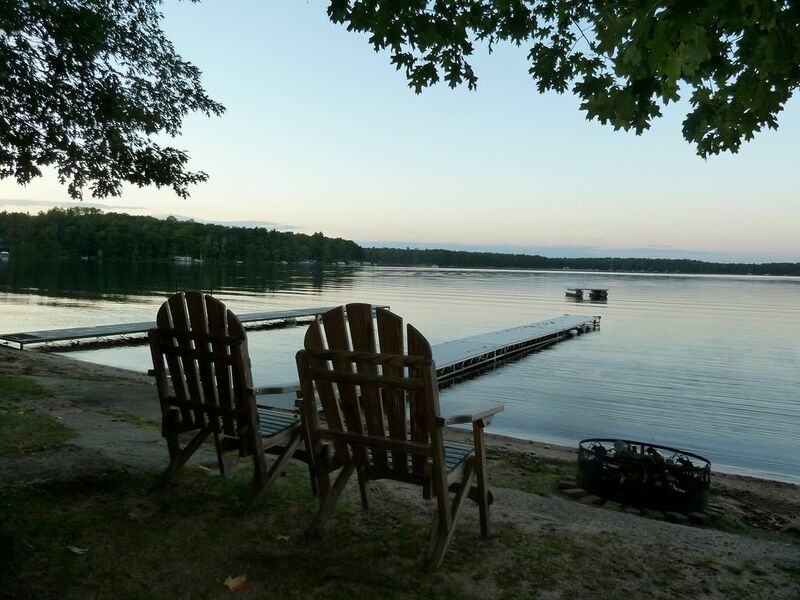 Without question, you will find no other cottage rental on Big Round Lake that will meet or exceed your lake vacation expectations. Having vacationed here my ENTIRE life, I can say that you need look no further for the one-of-a-kind treasure that is Slack's Edgewater Beach Resort. Enjoy! Hayward, Wisconsin is one of the Midwest's most popular tourist destinations! Offering an explansive Chequamegon National Forest, prime Hayward Lakes Area fishing waters, the North America’s largest Honor the Earth Pow Wow, our local Annual Musky Festival/Chequamegon Fat Tire Festival, and of course the Annual Lumberjack World Championships, Hayward is sure to please the entire family. It has been a repeat travel destination for many families year after year, and we'd love for you to come experience what our town has to offer. Rentals are made on a Saturday to Saturday basis (i.e. check in Saturday afternoon and check-out the following Saturday at 9:00 a.m.